plasma physicists are using lasers to produce shockwaves on the external surface of micro-particle. Attention is then given to what is happening within this micro-particle 3D convergent geometry. However, when a laser beam hit a solid surface, matter is extracted and rapidly accelerated. making this extracted matter to collide convergently on itself. an exceptional radiative interaction has been reported. - In Laser Ring Target, the particle flow is mainly radially, with little momentum in the axial direction. which may well occur to late for fusion consideration anyway? - The notion of pressure is associated with a thermalized gas and not with a particle beam. but "pressure lost" apply only later during plasma accumulation and thermalization. The first particle front is the interesting period (at least for fusion), not the late plasma thermalization. not completely in the thermal state. A very interesting consideration..
it can be made to direct the matter into this radiation area for post heating by multi laser pulses. (interesting also for non fusion plasma generator). while the Laser Ring Targer pressure chamber can be externally controlled. while Laser Ring Target could involve much more matter, and a lot more interactions per cycle. 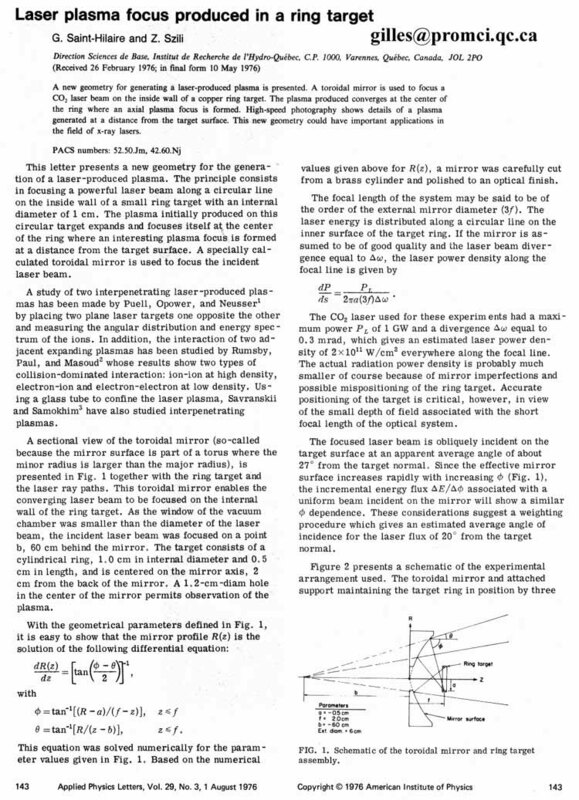 while Laser Ring Target is eventually easily scalable. in which a flat target strip can be continuously pull-in around and out. the focal point is replaced by a focal line around the inside of the ring target. - The Laser Ring Target geometry further concentrate all the radiation on the axis in the forward area. By making the ring slightly taper, one can direct the matter into this radiation area for post heating by multi laser pulses. (mostly interesting for non-fusion plasma generator). we have exceptionally made a temporary copy on this private page. Bonjour Mitchell, Merci pour votre commentaire. - The particle flow is mainly radially, with little momentum in the axial direction. - Laser ring target open the door for fusion plasma not completely in the thermal state. Very interesting. 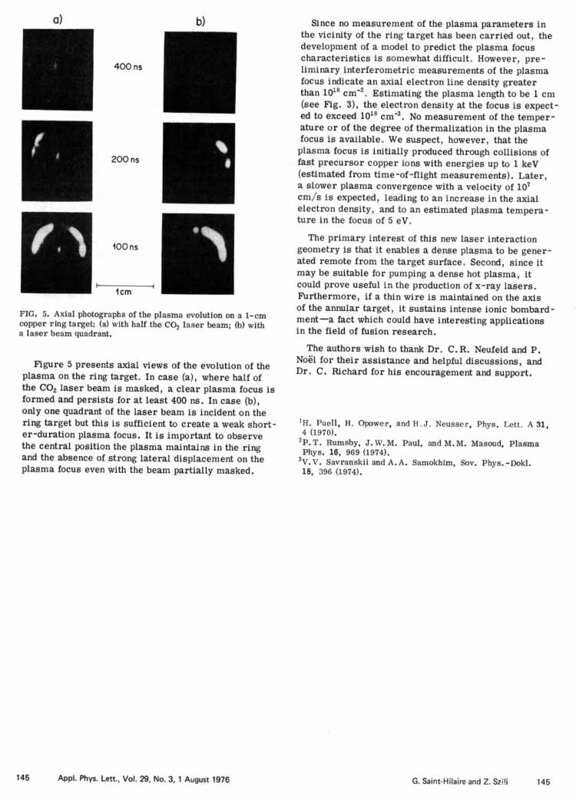 can be made to direct the matter into this radiation area for post heating by multi laser pulses. - Cavitation bubble will not be easy to scale up, while laser ring target is eventually scalable. in which a flat target strip could be continuously pull-in around and out. Hope theses comments will suggest you still a better experiment design? Q1- what is the connection? Q2- what is the significance expected from such a research? with a focal point else than convergence of light waves? new way to play, hence I ask, what is new? > with little momentum in the axial direction. > which may well occur to late for fusion consideration anyway? > not completely in the thermal state. Very interesting consideration. > into this radiation area for post heating. 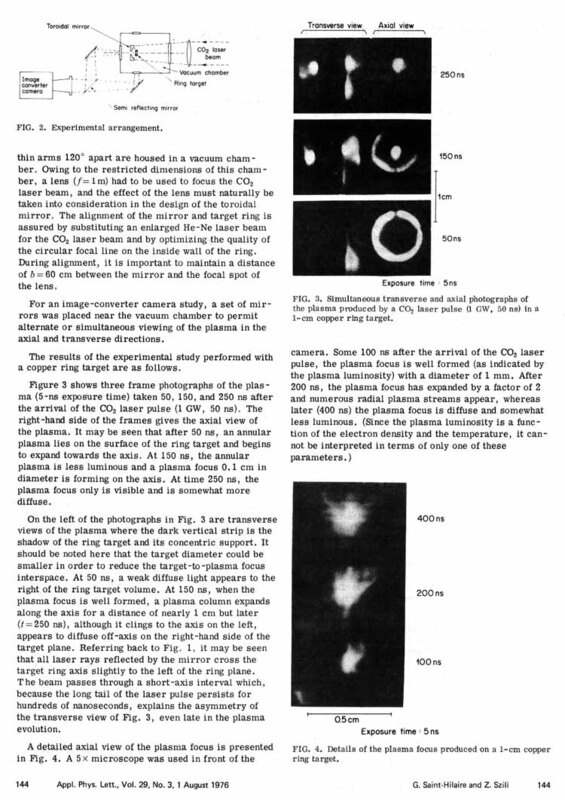 > (interesting also for non fusion plasma générator). > while Laser ring target could involve much more matter, and a lot more interactions per cycle. > while laser ring target is eventually scalable. > in which a flat target strip could be continuously pull-in around and out. such means, the maintenance of a continuous plasma should be possible. > Hope theses comments will suggest you still a better experiment design? rather than a Cu ring, and load it before zapping it in the apparatus. > rather than a Cu ring, and load it before zapping it in the apparatus. but only later during plasma thermalization. not with the later plasma accumulation (at least for fusion). and much of the result will depend of the effective diameter. My opinion is that no one has a definitive answer on that yet? but only a different approach with a potential still to verify? In Science, nothing is perfect, except nature! much before the PC-XT was available! and my Laser Ring Target was far off the main stream. by my lab (fortunately, they approved the paper out!). and run again using a deuterium-loaded Pd ring. > but only later during plasma thermalization. > not with the later plasma accumulation (at least for fusion). > and much of the result will depend of the effective diameter. > My opinion is that no one has a definitive answer on that yet? > but only a different approach with a potential still to verify? > In Science, nothing is perfect, except nature! > much before the PC-XT was available! > and my Laser Ring Target was far off the main stream. > by my lab (fortunately, they approved the paper out!). > All apparatus have been since dismantled. > and run again using a deuterium-loaded Pd ring. > perhaps someone will follow up on your approach. but I do not know however, if my lab would think the same? any of my superiors or colleagues and was done essentially off hours. too small for a full size laser beam window. which has complicated the calculation of the special mirror. to make its way safely though the machine shop paper work! I also remembers the couple weekends I spent polishing it. >>much before the PC-XT was available! >>and my Laser Ring Target was far off the main stream. >>by my lab (fortunately, they approved the paper out!). >>and run again using a deuterium-loaded Pd ring. what happens if the copper is a ball that is the diameter of the wavelength of light?